→What Are The Best ATV Tires For Snow This Winter? ATV riding could be an exciting outdoor activity that many of us would always want to try. In fact, even during the winter season, many people are into having fun with ATV riding. But in connection to that, choosing the best ATV snow tires must also be considered. Good to know that there are wide options of these snow tires that you could choose from. For a quick overview of the products included in our best ATV snow tires, consider this product comparison table. **Below, you'll find my more detailed reviews about the ATV snow tires, but you can also click the links above to see current prices or read customer reviews on Amazon. Best ATV Snow Tires: What To Look For? What Are The Best Options For Best ATV Snow Tires? ATV Ride On Snow Tips: How To Prepare? So Why Did I Choose This ATV Tire Chains 10 VBAR? To be more guided on whether which one is the best choice to consider, ATV snow tires review might be a great help. If looking for unmatched performance, this one is the best option to consider due to its quality features. This one is indeed a great choice for ATV riding during the winter season. It offers light weight, great performance and longevity all in one tire. ITP gave a solid and standard tread pattern which offers great control and feel on different surfaces like loose gravel and hard pack leading to outstanding traction. It also stepped shoulders which would provide you, even more control in turns and ruts due to its increased amount of side traction. You will indeed have a great performance tire which would not stop you from pulling forward with this 6-ply construction snow tire. ITP indeed has numbers of years with regards to experience in building wheels and tires that would handle demanding conditions of ATV racing as well as aggressive riding and this one only show how great their products are. ITP Holeshot H-D ATV tire could offer high performance on an array of conditions and terrains, particularly on snow. It handles most extreme trail conditions with unmatched durability and performance. Wider stance compared to others. It features sidewall construction for unmatched puncture resistance. Tires are being sold individually. It doesn’t come with rims. Indeed, a durable ATV tire for snow will perform a lot better. And this one is the best choice ever. 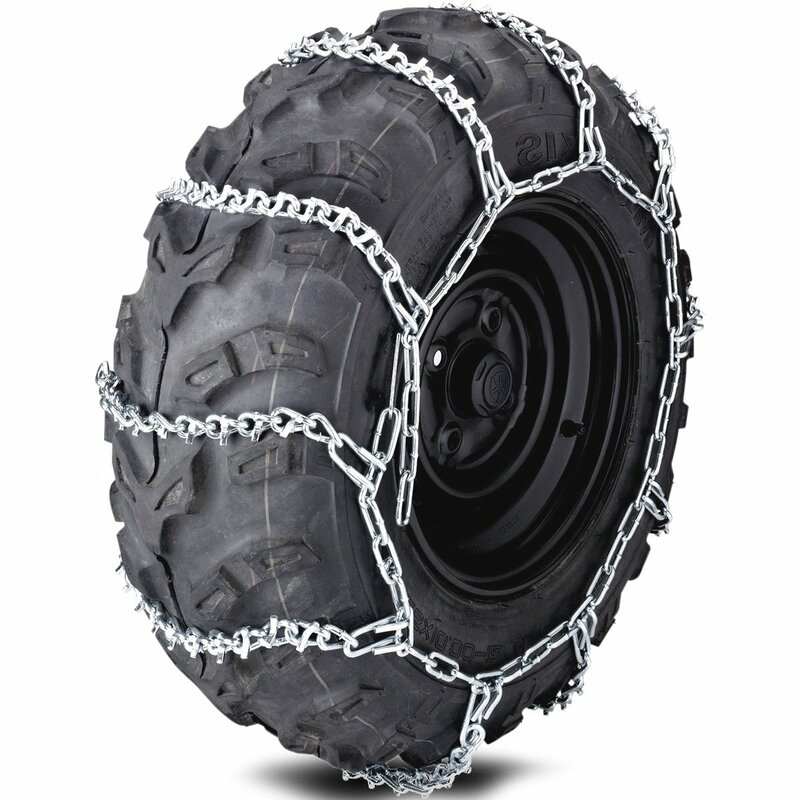 This ATV Tire Chains from Titan would maximize the traction of ATV on ice, snow or through the mud. Whether you might be riding for plowing the driveway or for fun, this would offer a hardened V-Bar cleats would keep you always on track. It is indeed designed for performance, and these chains would come in four different sizes in order to fit most of the tire sizes of ATV. This snow tire is indeed a very good tire chains that are easy to put on. It also has great gripping power and a tire that is well-built. There is no doubt with regards to the quality of this ATV tire for snow. There is an assurance of better traction as well along with having a nice design. It is hardened as intended for great durability. It has 4 tires suitable for most ATVs. There will be two tire chains included. It has no instruction for installation. Do you want a pair of best snow mud tire chains that is well-made and affordable? Well, this one should be considered. 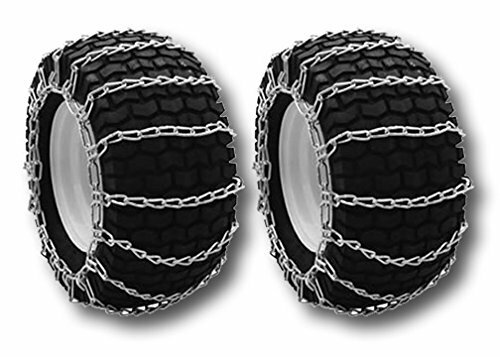 This pair of snow mud tire chains is indeed well-made and considered as good as one. This one is great for ice, mud or snow terrains. It also fits tires with different sizes like 14x5.50x5, 15x5.00x6, 15x6.00x6. It features set of two chains and two link design that offer additional traction during your ATV ride on snow or even on mud. It might as well require adjustments intended for an exact fit, though. You should not ignore including this as one from the best ATV tires for snow. Great chains for a great price too. It fits and works well. It is also easy to install. It might not fit large tread tires. The chain might fall between the tread. The best option for improved slipping tire ability as a solution from poor traction. For the best ATV snow tire that will get you unstuck from snow, this one is a great choice. This Trac-Grabber is a new revolutionary as well as an inexpensive device that is easily and quickly strapped into the drive wheels of the vehicle that is stuck in the snow, mud or sand. This would also enable the vehicle to get unstuck a lot easier and faster under its own power. Since it is being secured to the wheels, and the wheels would spin to the point where in this tire would lift, engage, grab and move the vehicle back to a stable terrain. In addition, this would offer a simple, quick and effective solution once being stranded as well as disabled within all kinds of terrain and also in adverse conditions. 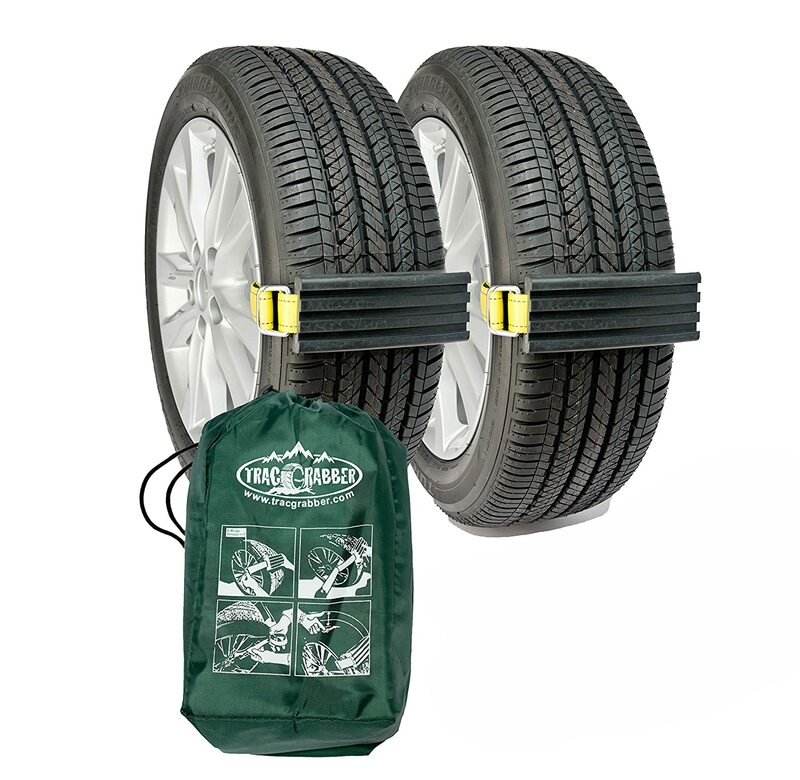 This tire will work great whether you are in mud, sand or in snow. It is designed to improve the slipping tire ability to extract from a poor traction situation. It is affordable, safe to use and easy to install. Very bulky and run only in short travel. Not on its highest quality of performance once already used on some other terrains. With this ATV snow tires review, indeed, you will be guided on whether which one suits your preferences and needs when it comes to riding ATV during the winter season. Along with the idea of choosing from wide options of ATV tires for snow, there are also certain factors you should as well consider. These factors will indeed lead you to discover the best out of the wide options. Since you will be dealing with deep snow traction, you would want to stay floating on top as possible and you might be avoiding digging down into the snow. The same with the situation once you are in the sand, excessive wheel spin is what you avoids. Therefore, wider tires having independent blocks or tread paddles that would run radically across the tread are the best options to consider. Some ATV mud tires would feature deep chevron-shaped paddles that would cause the tires to deeply dig into the loose snow. The large void area and the wide bars would also mean fewer radial edges as well as a direct contact with a packed ice or snow surface. This will then lead to a less grip on a well traveled packed snow as well as icy trails. Another consideration is the type of tread rubber compound. Indeed, best ATV tires for snow would have rubber compounds which stay more pliable once in colder temperatures. There will be an assurance of providing great grip on ice or cold dry roads and trails if the rubber is softer since it flexes around the terrain obstacles and irregularities. So, if you are in need of versatility that an all-terrain tire offers, then you should choose the one having an all-season tread compound. This would assure you that the tread rubber will not overly harden once in cold temperatures. They have tread compounds and tread design that are manufactured in order to specifically perform in cold or winter conditions. The tread design would feature high sipe density intended for better traction. They also have wide circumferential grooves that help to channel ice, snow, water or slush away from the surface of the tire leading to better contact between the road and tire. And the tread compounds are being engineered in allowing optimal performance of the tire once on snow. Though the vehicle is already equipped with ABS braking or traction control, winter tires are indeed beneficial. This electronic device would aid in preventing wheel spin due to overpowering the vehicle. It would also prevent the brakes from locking up because of braking. Winter tires will also extend the life of the summer tires. It would protect the original equipment or the aftermarket alloy wheels from the harsh elements of winter causing deterioration. Indeed, the best alternatives to a set of best ATV tires for snow would be a set of good all-terrain tires having tread features which would aid once in deep snow traction. In addition, some ATV mud tires, as well as all-terrain tires, could also be studded. Studs would definitely improve the grip once in the deep snow, on an ice and packed snow making this as a fairly common solution for most riders out there. And another great option is snow chain. Snow chains are easily installed for the occasional ride on snow and also an excellent alternative once the regular tires are not rendering the grip that you want. There is a need to consider your gear and equipment before riding in the snow. Consider wearing waterproof pants but it should not be slippery. Full-face helmet and gl﻿﻿﻿﻿ove﻿﻿﻿﻿s should also be considered. Carefully choose the shoes you are to wear too. Checking the pressure of the tire must also be considered. For most riding conditions, low pressure is advised. However, in snow, it would be better to consider higher pressure. This would let the ATV to easily slide through the snow and then feel lighter as well. Checking the winch is another consideration. See whether it is operational. This would be the easiest mechanism in order to rescue yourself from frustrating ordeal having not to damage the ATV. Adding some accessories to the ATV could also make the ride a lot more comfortable. There are numbers of accessories out there like snow plow or snowblower, track kits and more. You will definitely have great ATV ride on snow if you are well-prepared. What makes ATV snow tires different the all-season tires? Winter tires or ATV snow tires have their tread patterns that are designed to dig down and to bite into the ice or snow. They are also made from softer rubber compounds which retain the flexibility in cold weather, therefore allow the tire to better conform to the road surface. Regular tires would tend to get brittle and hard in cold temperatures. Can I put snow tires only on the drive wheels of the ATV? Putting only two tires could be a bad idea. This would make the ATV spin out while cornering or braking. The ATV might not also respond once the steering wheel is being turned. There is always a need to install a complete set of snow tires for ATV. Can I leave the snow tires on ATV all year? Yes, you can but it is not considered as a good idea. Snow tires could be a bit noisier and the softer compounds they have would mean that they would wear out a lot faster particularly in warm weather. Winter tires would rely on deep tread in order to dig to ice and snow and so wear is critical. The above-mentioned options for the best ATV snow tires are indeed capable of making our ride fun and a lot more exciting. However, there is a need to choose the one that would sit on top of the options. And this best one is the ATV Tire Chains 10 VBAR. It was hard to decide whether which one is the best to choose but with the reasons as to why this one stands out from among others made the process of decision making a lot easier. It also has features that make it a lot suitable as ATV tire for snow. The price of this tire is also reasonable enough for its quality. 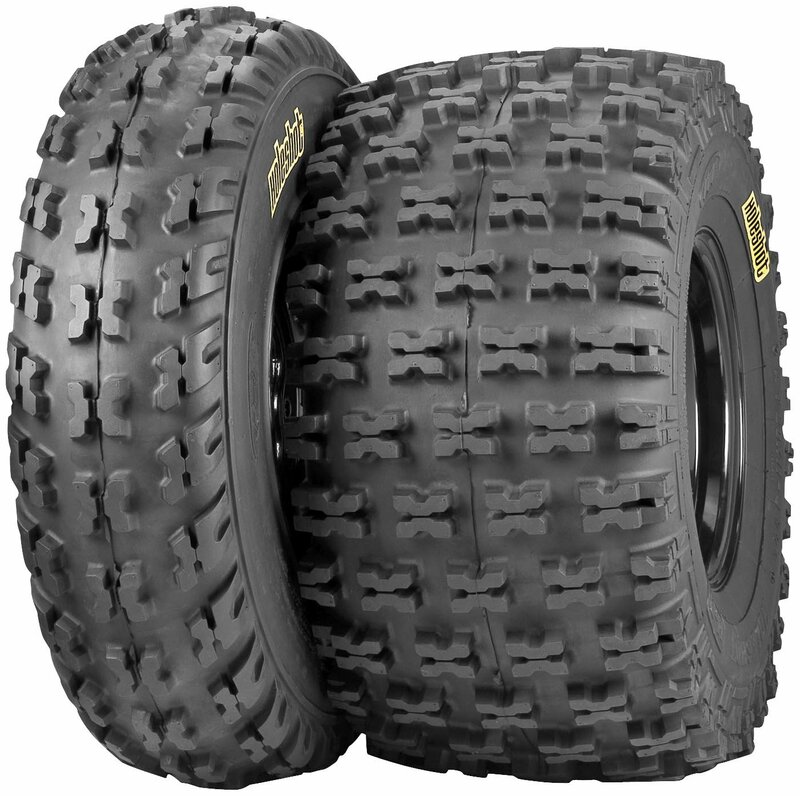 This ATV tire is indeed designed for high performance riding within a variety of conditions. There are indeed numbers of manufacturers out there that are into providing ATV tires that would perfectly suit a particular terrain. With that, there is an assurance that even during the winter season, when snow is all out there, you could still enjoy riding your ATV. This ATV snow tires review will help you find the right one. Did you like this article? If yes, feel free to post your comments or suggestions below. If you found it interesting, share this article too!